New feeding routine for your cat? It may help your cat more than you think! For many pet owners, cats and feeding time seem pretty straightforward enough. Either you are leaving a bowl of food out all the time and your cat eats when hungry, or you have scheduled meal times (which of course your cat tries to move earlier each day!). 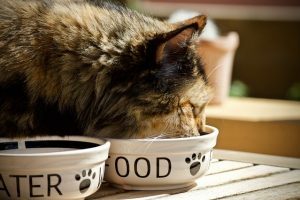 So you’re probably thinking “What more could you possibly tell me about cat’s and feeding (other than don’t let them overeat and become overweight)?” Well, it turns out that there is a lot to say about how we feed our cats. So much in fact that the American Association of Feline Practitioners (AAFP) recently published a Consensus Statement covering how to feed a cat (Feline Feeding Programs: Addressing Behavioural Needs to Improve Feline Health and Wellbeing: AAFP 2018)! 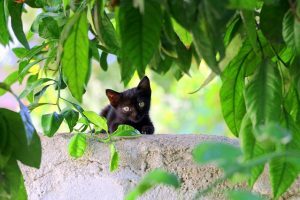 Gaining an understanding of a cat’s natural feeding behavior can lead to an understanding of what we should be doing for our pet cats. We can implement strategies during feeding time that satisfy a cat’s normal behavioral needs for play and predation. We can optimize feeding strategies to minimize stress for anxious cats (whether they are in single or multi-cat environments). Feeding strategies should of course meet nutritional requirements with a goal of overall health for the pet. As carnivores, cats have a strong hunting instinct. Puzzle feeders are a great tool. You can also put food and treats around the house that your cat has to ‘hunt’ for. Puzzle feeders can be purchased, but they can also be homemade! Cats prefer to eat alone. Stress during eating can occur if there are stressful encounters (with other cats, a dog, small children, etc.). Stress can lead to medical issues such as cystitis and inappropriate use of the litter box. Cats enjoy eating multiple small meals in a day. This means that feeding one or two large meals does not meet this behavioral need, which may lead to decreased activity level, stress, overeating (and obesity). Managing the amount of food eaten is an important part of keeping cats at an ideal weight. In addition to measuring food amounts, automatic feeders may also be helpful. While it is important to not overfeed, it’s equally important to make sure your cat is eating enough. For multi-cat environments, it’s a good idea to provide separate feeding stations with distance and visual separation. You can also use elevated spaces to separate. Since cats prefer to eat alone, forcing a cat to eat near another cat can create anxiety, stress, and health problems. This anxiety may or may not be obvious in the moment. After reading through the information in the new consensus statement, it may seem like a lot of things need to change in your feeding strategies. If you decide to try some new ideas, be sure to take it slow and make small changes gradually. Not only will this allow you to assess whether the change has made a positive impact, it will also help your cat not be caught off guard by a complete routine change (we all know how cats like their routines!). It will be important to make sure your cat is still getting his or her daily nutrition as you make changes. For example, if you decide to encourage your cat to ‘forage’ for food around the house – either make sure all the food gets eaten (by the correct pet), or only put a few kibbles around at first so you can make sure your cat still gets the food from the bowl. 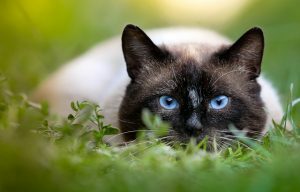 Finally, to learn more about feeding cats, as well as all sorts of other cat care topics, you can visit the American Association of Feline Practitioner’s website for cat owners catfriendly.com.